Help make the bathroom a clean, germ-free environment. 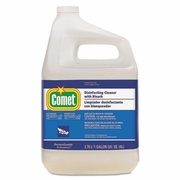 Heavy-duty detergents with Chlorinol® bleach power through soap scum, grease and hard-water stains without scrubbing. Disinfects and deodorizes toilets and urinals. Nonabrasive formula.